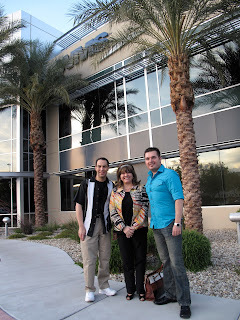 LAS VEGAS DAZE: WMS Slot Studio! 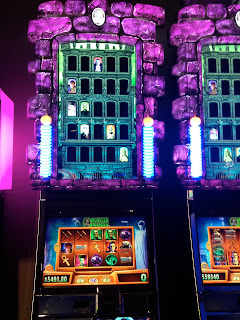 The showroom had some of their older successful slots like Wizard of Oz, along with ones currently being introduced to casinos and a few that were still in testing and would be released later this year. Slotspert and I headed immediately to the new Gone with the Wind Slot! I liked this slot, the graphics, the bonuses and the music. Thanks to a friendly developer Slotspert and I were able to see what all the bonuses would look like. Gone with the Wind is a video reel type slot and the bonuses are the usual free spins or picking bonuses but the slot is sure to be a winner for Gone with the Wind movie fans! 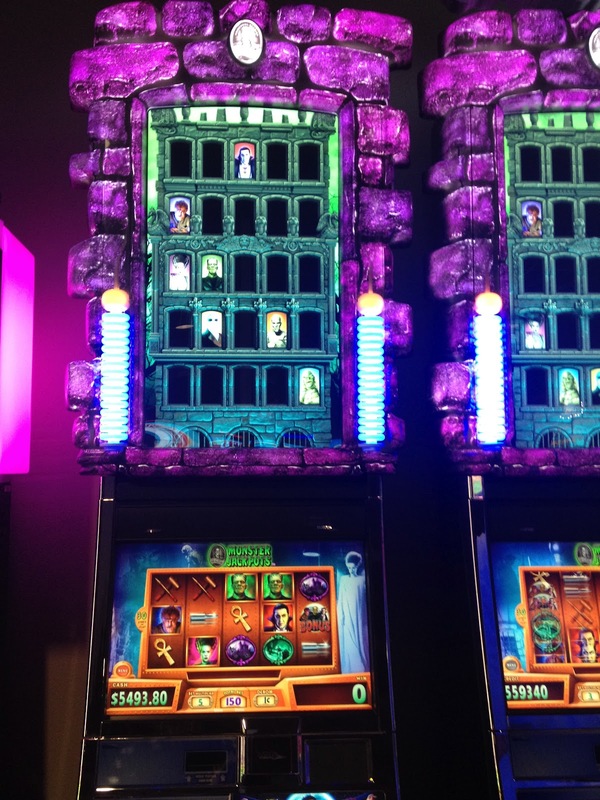 We were told this slot would likely start making its way to casino floors in June. 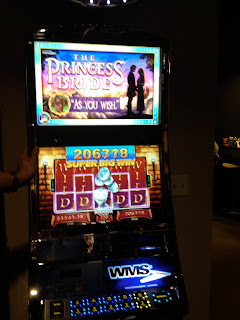 My only disappointment during my visit to WMS was they didn't have the Aladdin slot with sensory sound and motion that I had played in October at G2E on hand. I was surprised it wasn't there to play as they are still saying that Aladdin will also ship around June. One of the slots that I really liked both the theme and the bonuses was Monster Jackpots. With my usual lack of luck so far in 2012 I just couldn't get a bonus on Monster Jackpots so had to rely on one of the developer's to turn them on for me. While I like this slot, Rambler who was there told me he didn't care for the music, so some other slot players might not like it for that reason. Also on hand was Baron Von Bacons Million Credit Bonus slot which I later played at Venetian during the trip. Unfortunately I didn't get the bonus at WMS when playing for free and didn't get it later at Venetian, so at the moment I'm thinking perhaps it's too volatile for me. Of course this year I'm thinking that with almost all the slots! After getting to play as much as I wanted on the display slots it was time for my group to participate in the focus study. Due to privacy issues I didn't take any photos there and since I'm not sure we're permitted to discuss what we talked about, I'll just say that most of us in the focus group were not shy about giving our opinions about what we like and dislike in slot play. 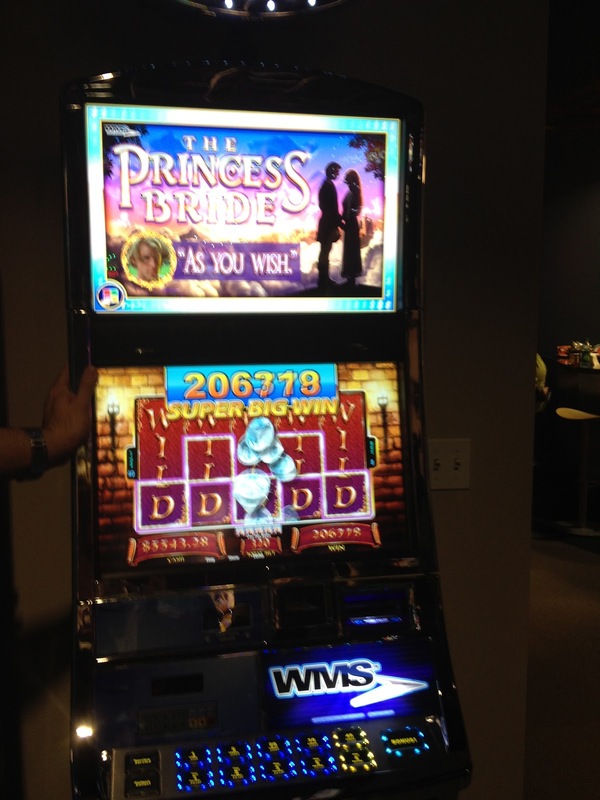 As we were winding up and getting ready to leave our tour of WMS studios the developers let us have some fun with getting screens of wilds on a couple of the slots. Oh, if only this had occurred in real casino play! Thanks WMS, and Shamus for a couple fun hours! For everyone. That win on the Princess Bride was a Nickel Denom, $32 bet. Win of $32,0000!!!!! What a great opportunity! I would love to get to go to a developing slot studio. Shame that SUPER BIG WIN wasn't for real. Much luck to you next trip! Now that is a cool tour. I wouldn't mind going on one of those myself. Is this open to the public or do you have to know someone to tour? Thanks for sharing your pics. Great writeup too. Thanks Terrie. They aren't open to the public, you have to be invited to one of their events or focus studies. In our case Shamus the moderator for the players life forum set it up with WMS. Thanks for the report Diana. It was fun to visit WMS and I think if any of you out there reading this get an opportunity to do so you would really enjoy it. It was a very enjoyable experience and they were very welcoming to our group. Hi Diana, My sis and I love your posts. Since we make several trips to LV each year, we always read your posts first to see what slots are playing. 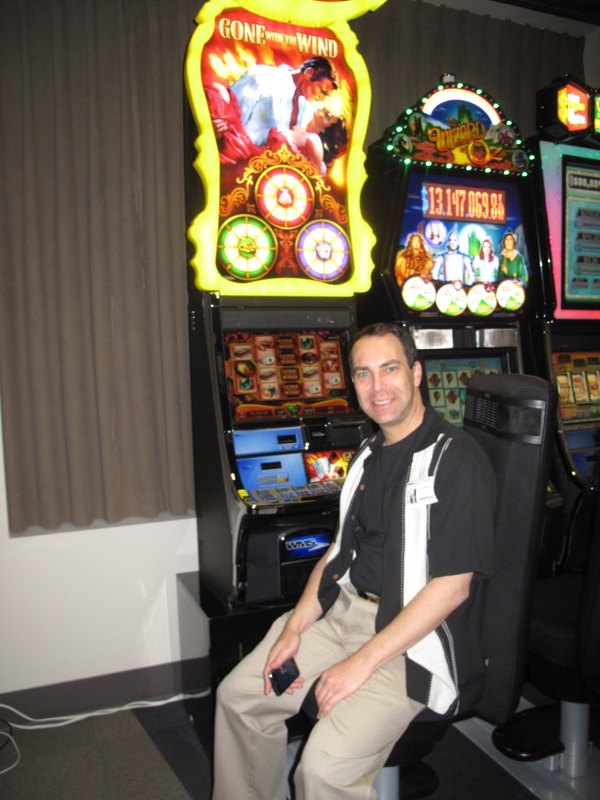 LOL,it doesn't always work but I sure have played some different machines and even won on them.the visit to WMS was cool - wish my schedule would have allowed me to go to Las Vegas during the Slot Machine Forums annual meeting. Thanx for keeping us up to date. This company has really demonstrated their ability to produce a high quality product and no doubt they will continue to provide an excellent return for their stockholders. Anonymous, I'm sorry your scheduled didn't let you attend the SMF meet this year, hopefully next year you will be able to join the fun. Aricczona, have a a great trip next week in Vegas. My husband and I would have been there that weekend for Vegas Uncork'd but it turns out we are moving this month instead. 80 boxes packed, only about 200 plus to go, and we're only moving less then 10 miles away but it's turning out to be more work then I expected. Hope you come back from your trip with lots of fun stories and of course a big win or two! If we are lucky, we might get the opportunity to put something together like this next year. Keeps your eyes peeled on Player's Life (playerslife.com) for more details next year. It's a another little perk for signing up with a Player's Life ID. Shamus, that would be great if we could do it again next year!